Private equity has three major exit ramps—the strategic sale, the secondary buyout and the IPO. They tend to trend independently of one another, which is to say that market dynamics usually favor one or two options over the other(s). IPO volume is tiny compared to outright sales, but there is some insight to glean from corporate acquisitions and SBOs. And exit prices split out by type are indicative of how much demand is built in for each. For sellers, outright sales end with the same result—a check covering the full amount of the exit. Strategic acquisitions have their own logic to them, and corporate M&A doesn't happen in a vacuum—each deal needs to achieve something for that particular acquirer. It's the difference between shopping for the sake of it and going to the store to buy something specific. Corporate America doesn't do the former. Private equity firms do, to some degree, when they have a lot of money to spend and a mandate to spend it. The featured chart indicates a widening gap between SBO and strategic acquisition exit prices in the US. In the span of four years, the median SBO exit size has almost doubled, going from $220 million in 2015 to $410 million last year. A glass-half-full interpretation of that increasing gap is that PE-backed companies have grown in value over that timespan, which ought to be true if the first investors did their job in creating new value. A second explanation is that PE-backed companies have simply become more valuable to other private equity firms. Certain companies and business models are more conducive to PE ownership than others, according to several studies—some going back to the 1980s. If those deals are happening enough to impact current trends, it stands to reason that SBO exit prices are heading north as well. From the lower-middle-market on up, there are more funds in play—with more capital than ever—to fuel secondary buyout activity for the foreseeable future. This column was originally published in The Lead Left. 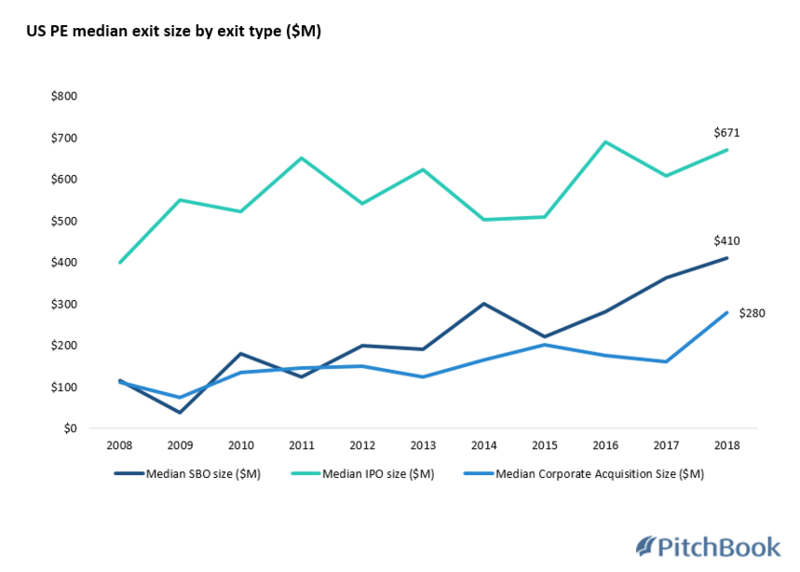 Read more about exits in our 1Q 2019 US PE Breakdown.